A small free standing fireplace that may also be used as an oven for baking foods. Originating in South America, this wood burning device was initially developed to provide heat and a means to cook food within homes; however, it is also commonly used outdoors in gardens and other areas to provide an outdoor fireplace as well as a cooking oven. Foods such as breads, poultry, fish, potatoes, and meats are often prepared with the use of a Chiminea. Smoking woods are available for use in the Chiminea, which are typically split into longer pieces than the common wood chips or wood chunks so often used for smoking foods in other devices. Chiminea smoker woods, or logs, may range from 6 to 14 inches in length, which are similar to the lengths of wood used for kindling in many other types of fireplaces and cooking devices. Chiminea fireplaces may be constructed from cast iron, cast aluminum, or clay. The Chiminea is usually made with a round burning chamber with a smokestack placed above it. 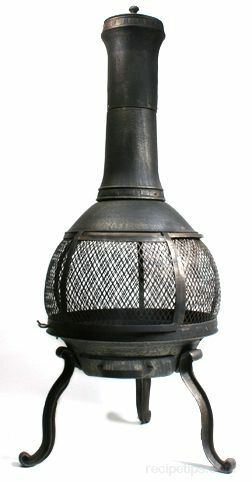 The overall size of the Chiminea may range from 4 to 6 feet high and 2 to 3 feet wide. The metal Chiminea is the most durable and allows fires to burn for long periods of time. A clay Chiminea is not as durable as metal versions and may become damaged from excessive heat. Cracking of the clay is a common problem, which weakens the chiminea structurally. If the clay Chiminea is labeled as air-dried it must be treated with a sealer prior to use, such as a heat resistant sealer or paint. A kiln-dried Chiminea does not typically require treating or sealing; however, it is best to consult the manufacturer or the retail store that sells the Chiminea to ensure that this is the case. A Chiminea may also be referred to as a Patio Fireplace or an Offset Smoker; however, both of these names may refer to other types of free standing fireplaces that are different from a traditional Chiminea. For example, Offset Smokers are typically built with a wide cylinder-like enclosed firebox in which a fire is started for grilling, smoking, or barbecuing foods on grates that are placed over the burning chamber within the firebox.